The farm, off Route 50 and south of the Spa State Park, is home to two thriving businesses. If it’s your first time approaching Top Rail Farm, home of Burke Equine Veterinary Rehabilitation and Therapy, watch carefully for the unassuming turn-off, a meandering dirt road punctuated by a rustic swinging gate beneath a canopy of trees. Soon you’ll catch a glimpse of a charming white Greek Revival farmhouse, with a front porch perfect for anyone with a penchant for long conversations. But Top Rail Farm in Saratoga Springs, off Route 50 and south of Saratoga Spa State Park, is home to two thriving businesses. The farm is a little piece of heaven on earth for Dr. Stowe Burke and his wife Caroline, Saratoga mainstays who are raising their children, 8-year-old Minnie and 4-year-old Henry, on a 104-acre property that’s been in his family since his grandmother, Virginia Hayward Parker, purchased it in the 1950s. 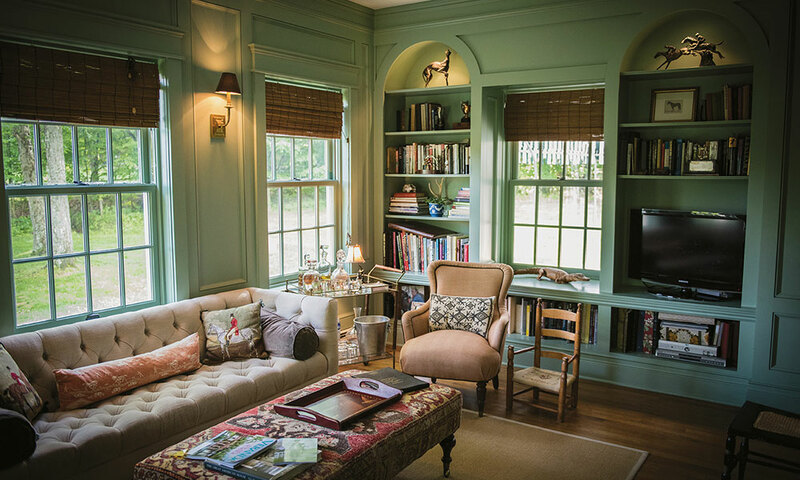 Though their farmhouse is a mere six years old, it speaks of another era and represents their love for classic elegance and modern convenience. 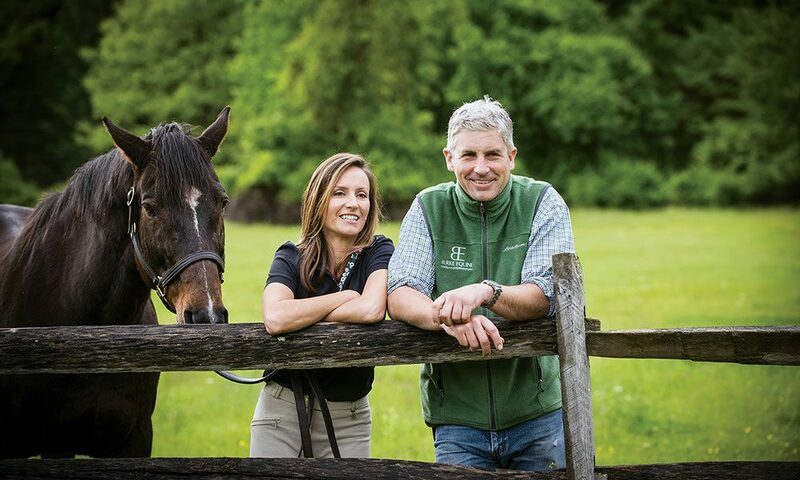 Here, Stowe runs his prominent equestrian therapy practice, and Caroline runs an interior design firm. There is an odd overlapping of their enterprises that adds humor to their days. Watching the recent Belmont Stakes, they cheered for different horses. Caroline’s client had a horse racing, another client was a jockey, and Stowe had a third client connection. Stowe points to the little barnyard cottage just down the hill from the farmhouse, their main home. They lived on and off in the cottage since they were in their early 20s. Their home is a perfect blend of history, holding tight to tradition and family, and creating something contemporary with their unique stamp. Caroline graduated and took a local job in publishing, but soon felt she needed a more creative outlet. She decided on graduate school for interior design at the University of Florida while Stowe tackled veterinary school at Tufts. The cottage remained home base, but they spent years in different schools and different cities. Eventually Stowe took a job in Ocala, Florida – horse country – knowing all along he would be specialize in racetrack medicine. Stowe’s family is originally from Boston. His grandparents met at the Norfolk Hunt in Massachusetts and were married when his grandfather was in the cavalry, the last one in existence during World War II. Their marriage didn’t survive; he left to ride steeplechase races in Canada. His grandfather’s career was illustrious. At one point, he was responsible for breaking 180 yearlings each season at Spendthrift Farm. One of these horses was multiple-stakes winner Lucky Lucky Lucky, as well as the 1985 Prix de l’Arc de Triomphe winner, Rainbow Quest. In the 1950s, Stowe’s grandmother came to Saratoga for the Fasig-Tipton yearling sales and fell for the region, prompting her to buy the farm. Originally, the property included what is now the enormous Villa Balsamo house, where she and Stowe’s father rambled around – just the two of them. Stowe’s father attended a one-room schoolhouse across the road, riding horses there as well. Stowe has quite a collection of stories and photographs to illustrate how different Saratoga was then – a far cry from how the city looks and feels today. For one thing, farms the size of the Burkes’ are now a rarity. For a little more than a decade, Stowe and Caroline traveled back and forth from Florida to Saratoga. Caroline describes this point in time as grueling and intense; Stowe was working with the best Thoroughbreds in the world, preparing for Breeders’ Cup and Triple Crown races with trainers like Todd Pletcher, Kiaran McLaughlin and Nick Zito. Having the two children made the constant moving more of a challenge. Caroline was fortunate to be working freelance for local architecture firm Phinney Design Group, and what she describes next was a “perfect storm of events.” Stowe’s grandmother, who remained on the farm, was not able to live on her own any longer and that situation coincided with the death of Stowe’s good friend, steeplechase trainer Tom Voss. This was no easy decision. Stowe had such an incredible job, working the racetrack circuit with an excellent practice and clients. But it did not take long for Stowe to hit his stride in Saratoga. The world-renowned Rood & Riddle Equine Hospital came to Saratoga from Lexington and asked Stowe if he would take on post-surgery cases. Soon, Burke Equine was born, as a rehabilitation center devoted to sport horses. “Each horse is an individual, like any patient. I wanted to get into the meat of fixing them myself,” Stowe explains. This desire spurred Stowe to build a treatment center at the farm, complete with an AquaPacer, a water treadmill for horses, as well as a healing cold saltwater spa, grass gallops and a dirt training track. Horses recover without losing their fitness at his rehab facility. He wears many hats, from vet, to trainer, to rider, and there’s no doubt he’s adept at each demanding role. 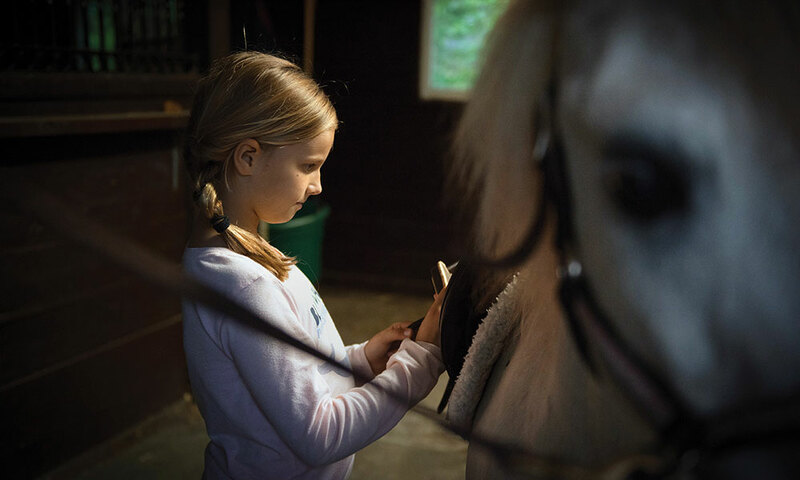 The horses can spend months recovering at Burke Equine, receiving veterinary care and pre-training in one bucolic off-track setting. Their combination is a success with the results reflecting just how effective Burke’s therapy and rehab are for injured horses. Many recovered horses have gone on to be winners, and there will certainly be more in the near future. Show horses, harness horses and barrel racers also end up at Burke Equine for treatment. A newly completed 22-stall barn has expanded capacity for the 2017 race meet. The frenetic pace continues with Caroline’s own successful design business, Top Rail Interiors. Caroline and Stowe have salvaged many old family photos from barns and cellars. Thankfully, they also had one remarkable photograph returned to them: an enlarged black-and-white image from a sale at Fasig-Tipton, where his grandfather had worked. Stowe’s handsome grandfather is seated beside C.Z. Guest, the socialite wife of Winston Churchill’s nephew. The photo used to hang in Saratoga’s beloved Spuyten Duyvil bar, a famous hangout of the past that adjoined the Fasig-Tipton horse auction pavilion. 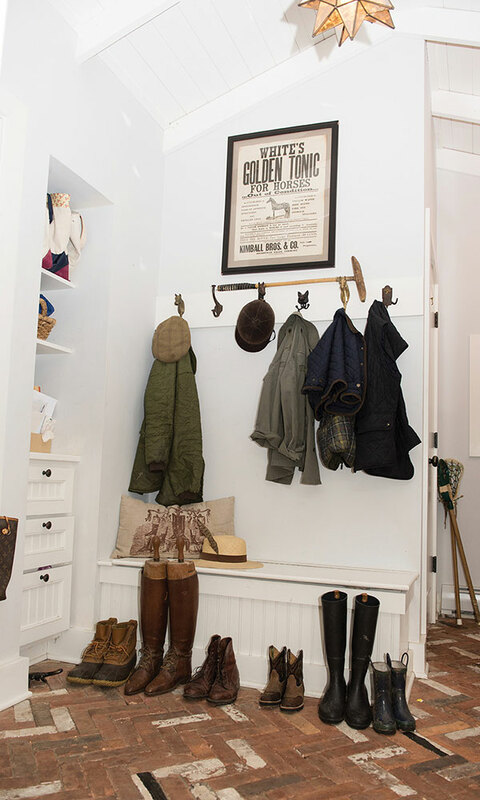 A number of photos of horses bred in the 1950s by his grandmother – one was trained by Woody Stephens, a Hall of Famer himself – also line the walls. These images are balanced by paintings by Stowe’s grandmother, which add to the sense of continuity, charm and nostalgia. 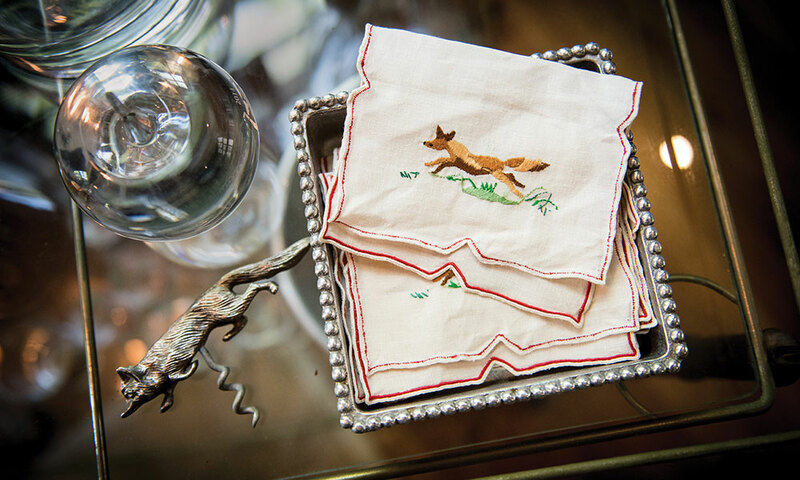 Caroline knows intuitively what one-of-a-kind pieces to salvage from old carriage houses or jockey quarters. She saved a white porcelain urinal from the Whitney property that is now the gorgeous focal point of their bathroom. But there’s no denying that the large barn doors, punctuating the formal front of the house from the casual back, feel like the very heart of their home. The doors were salvaged from Greentree stables, and Stowe remembers the world-record-setting racehorse Elusive Quality standing behind them. But as you move to Stowe’s rehab facilities, you suddenly remember the year is 2017. The AquaPacer and ECB Cold Saltwater Spa are high-tech and impressive. The water fills as high as the injury dictates in the AquaPacer; the horses only move at a good working walk to ensure they are using their bodies correctly so they won’t need any additional recovery time. Stowe understands the ideal balance of maintaining the horses’ cardio while strengthening their bones. That prevents re-injury when they return to training. The cold-water spa is set at 35 degrees and treats inflammation, a vet’s biggest enemy at the onset of injury. The salt water also helps any wounds heal. Both treatments take nearly an hour. The track stretches out beyond the pine trees by the new barn, which allows the horses a nice walk through the woods before their more demanding exercise. Stowe’s cell phone doesn’t stop. Numerous missed calls await him after a brief slice of the early afternoon when he was not able to answer. Racing season is upon us, and Burke Equine reflects the hustle and bustle of a Saratoga summer. However, at the end of a hectic day, filled with two children, design work and veterinary treatments, Stowe and Caroline can reflect. They can sit out on their quiet front porch, atop their little hill, and enjoy the home they created; respecting the past, commanding the present and building toward the future.